Not much is known about this model other than she is a center cockpit design. Word is that there were only 11 made, all in 1979, but only two have been spotted recently. Draft (cb up/down)    4' 6" /  9' 6"
One other little mystery. In his article, "Designing a Supercruiser" in Cruising World, March 1976, by Danny T. Greene writes "They are now working on a 40' test boat...". Could this be the prototype for the 11.8? Along these lines, Paul Esterle had talked to Ron Dahl (of Dahlfin II) about an 11+ meter boat. He had actually seen the boat. It was the only one built as far as he knew. It had some structural problems with inadequate support for the keel. Had to sister a whole lot more floors to firm it up and stop the leaks. Same boat as the one Greene refers to? I have one of the original 11.8s, built in 79, and owned by one of the Columbia dealers until I bought it in 1989. It is currently berthed in Marina Palmira, La Paz, BCS, undergoing a complete bottom job and refit before bringing it back to Coronado Cays. This is a great boat for its size, beefy, sturdy and can go to weather. I took on a serious storm enroute to Baja in the 90s that did a knockdown to a Hardin Ketch and some other large boats. The Columbia stood to weather and we were able to get it into the lee of an island and ride it out for three days. The high center cockpit is a dream with a good dodger, and my original 155 jib gave her some speed. Large fuel and water capacity, sleeps nicely, and feels good riding. I still have the Perkins 4-108, which is as reliable as you can get. 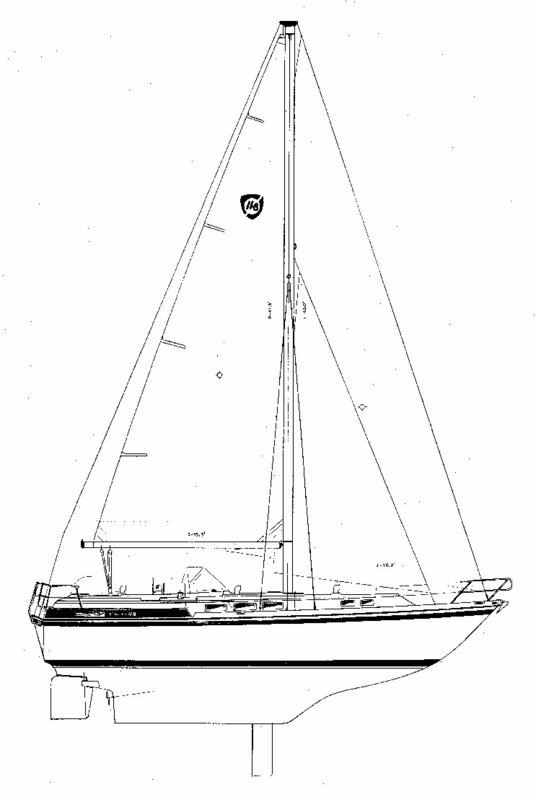 The 11.8 had heavy duty rigging, Lewmar 44s, and equipment like that. Fuel capacity is 125 with my rig and I carry 220 in water. It has an autopilot, the factory 16 mile radar still works like a charm, SSB, GPS moving map, old Loran, and a 4 burner stove. One short-change is the small propane cans, but that is a minor. I have done some reconfiguration on the batteries, put on two solar panels, and added an engine-mounted modern alternator. After cabin with Q-size bed is great, plenty of locker space.